I sit and look in wonder, at the soft, chubby cheeks on my youngest boy. I gaze into the playful, cartoonish eyes of my second youngest, and chuckle at the antics of my second-born. I sit next to my oldest as he processes absolutely all of his thoughts out loud, and I marvel. What amazes me is how often I can forget that these little ones that God has entrusted to me, are just little people. They want admiration, respect, recognition, and consideration just as much as the adult that brushes past you at the grocery store. They each have their own ideas, their own personalities, their own dreams. Each of them are different, and even though they are small, they are people. I have a tendency to forget this and just go about my day as if they inconvenience me. It's not that I don't love them, but sometimes I forget that THEY are my priority. It's not me, or what I want to do. My children are my priority - they should come before the other things that I think are important, or would like to prioritize. Almost daily, I find myself shooing my kids away so I can "get something done." At the end of the day, it makes me sad that I haven't taken the time with them that I really would have liked to, but I just feel like I don't know HOW to do that. 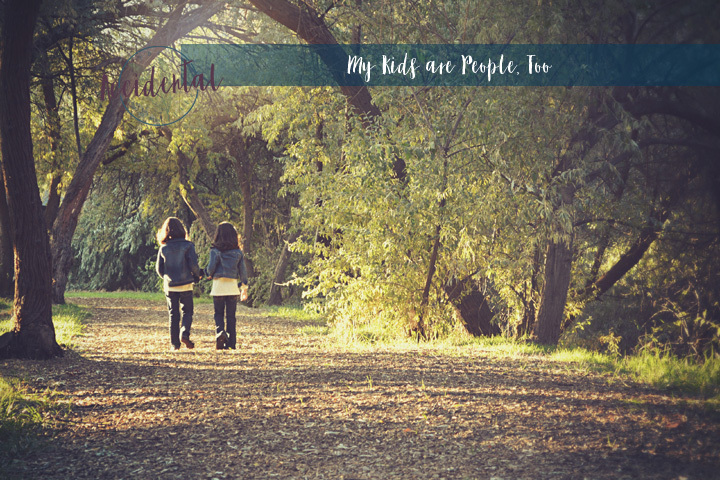 Often, I wonder at the relationships that other people seem to have with their kids - relationships that are like friends and they talk to their kids like people. While I talk to my kids, I don't hold conversations with them - I get frustrated and annoyed that I can't understand what they're saying. I desire to show them the love of Christ so deeply - I truly, deeply, love my children. It's just that I have a higher tendency to react to them rather than show love to them. So how do I change that? By making them a priority will change my response and my reaction to them. I can also daily make it part of my morning routine to ask for God's hear towards my children. Jesus make a point to sit down and welcome the children to his lap, I want to do the same. I want to be a solid, trustworthy place for my children to come to whenever they need anything. I want them to know how deeply I love them, and I want them to know Christ's love for them because of how I have loved them. It never ceases to amaze me how small a person can be in the beginning, while still being a person. What a privilege it is to watch them firsthand, grow into being a big person. I want to remember every day, how exciting it is to see their daily developments. They are precious, and I want them to know that. Do you have tips on living a healthy relationship with your kids? I'd love to hear how you prioritize your children and relationships with them! I love this. When I have a day that I recognize I'm not prioritizing my kids (they let me know by being unusually cranky or misbehaving out of the norm), I make it a goal and a point to put everything else down (realistically; I still need to go to the bathroom 😁). My kids are happier when they have more of me and their dad of course. But I can only control me. ❤️ You're a wonderful mama! I fully agree with Caitlin. Kids have a radar for when we're busy. One thing I'm trying to do (emphasis on trying here!) is to spend 15 minutes a day alone with each child. That might be sneaking to their room to play Legos, or cuddling in bed with them before everyone else wakes up, or going outside together to get the mail, check eggs, etc. It's nothing huge, but I feel them responding better to me when we've had some time to connect. Grace and strength to you, mama! You'll find a way that works best for your family.